Investigates the genetic regulation of biological clocks that underlie many activities of living organisms. The Young lab studies 24-hour circadian clocks, which time the recurring, daily activities observed in most organisms. These cellular clocks are active in most animal tissues and establish daily rhythms in physiology and behavior. The lab’s findings have implications for sleep and mood disorders as well as for dysfunctions related to the timing of gene activities underlying visual functions, locomotion, metabolism, immunity, learning, and memory. Internal biological mechanisms, called circadian clocks, control the timing of a host of biological functions in organisms from fruit flies to humans. Studies of the molecular basis for this circadian rhythmicity began in the early 1980s in Young’s lab at Rockefeller, and in the labs of Jeffrey C. Hall and Michael Rosbash at Brandeis University. Over the past 30 years, these investigators learned that the circadian clocks of Drosophila melanogaster are formed through the actions of a small group of genes including per (period), tim (timeless), dbt (double-time, casein kinase 1), clk (clock), cyc (cycle), sgg (shaggy), Pdp1 (PAR domain protein 1), vri (vrille), cry (cryptochrome) and ck2 (casein kinase 2). Mutations in any of these “clock” genes—six of which were first characterized in the Young lab—can lengthen or shorten the period of behavioral, physiological, and molecular circadian rhythms, or abolish the rhythms altogether. The expression of several clock genes oscillates in wild-type flies. Two of the proteins encoded by these genes, TIM and PER, regulate their own expression through a feedback loop. TIM binds to and stabilizes PER, and allows both proteins to move to the nucleus, where their presence switches off their further synthesis. After several hours, PER and TIM decay, reinitiating the 24-hour cycle of synthesis and inhibition. The circadian clock adjusts to environmental light through CRY, which in flies is a novel photoreceptor that binds to TIM in the presence of light and promotes TIM’s rapid degradation, pausing the clock until TIM can re-accumulate in the dark. Young’s lab has discovered that the enzyme casein kinase 1 (DBT) further regulates the pace of this 24-hour molecular clock by limiting the longevity of the PER protein during each circadian cycle, and especially by removing PER when TIM is absent. Most of the genes composing the Drosophila clock, and the cycling intracellular mechanism they direct, are well conserved throughout the animal kingdom. The Young lab has found that approximately seven percent of all genes active in the Drosophila head are expressed with a circadian rhythm. Genes composing this large circadian program influence almost every aspect of the fly’s biology, and subsets are switched on and off with phases representing every hour of the day and night. When genes that compose the circadian clock are mutated, this program of temporally sequenced gene expression disappears even if environmental cycles are present, indicating that the temporal program is thoroughly dependent on the molecular oscillator. Members of the lab have identified genes that affect the homeostatic regulation of sleep in Drosophila. They are also studying how sleep and circadian rhythms are regulated at the genetic and molecular levels in humans. Young’s lab recently identified a CRY variant associated with a form of delayed sleep phase disorder (DSPD) that may affect approximately one in 75 individuals of non-Finnish European ancestry. The most commonly diagnosed type of circadian rhythm sleep disorder, DSPD is characterized by a persistent and intractable delay of sleep onset and offset times relative to the societal norm. Kidd, P.B. et al. Temperature compensation and temperature sensation in the circadian clock. Proc. Natl. Acad. Sci. U.S.A. 112, E6284–E6292 (2015). Rogulja, D. and Young, M.W. Control of sleep by cyclin A and its regulator. Science 335, 1617–1621 (2012). Stavropoulos, N. and Young, M.W. insomniac and Cullin-3 regulate sleep and wakefulness in Drosophila. Neuron 72, 964–976 (2011). Zoltowski, B.D. et al. Structure of full-length Drosophila cryptochrome. Nature 480, 396–399 (2011). Young was honored for his discoveries of molecular mechanisms controlling the circadian rhythm. He accepted the Nobel medal and diploma from King Carl XVI Gustaf of Sweden. 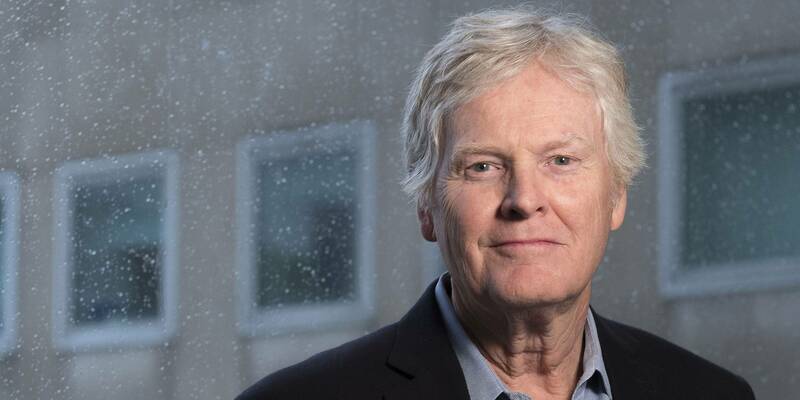 Rockefeller University biologist Michael W. Young, who studies the biological clocks that regulate sleep, metabolism, and response to disease, is this year’s recipient of the Nobel Prize in Physiology or Medicine.